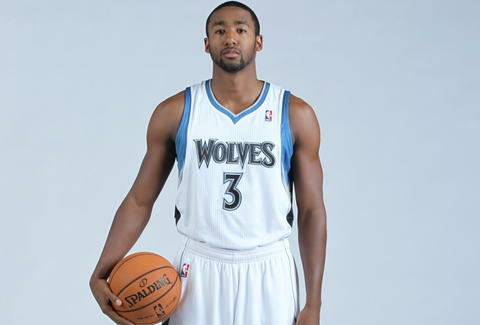 Psyched about the Wolves' young, mega-talented (albeit sashimi-raw) roster, we sat down with rookie Malcolm Lee, who got super-honest when he noticed we were sitting down the cool way (chair backward, leaning forward on the backrest), and gave us his take on the franchise, this team, and moving to the Minneapple. You grew up in SoCal, went to school at UCLA, and now you're living the dream... in Minneapolis. What's that like? It's definitely a culture shock going from SoCal where it's like 80 degrees to Minneapolis where it's like 20 below. Y'all don't even have a Cheesecake Factory. Yes we do. Wha? I was looking on my GPS and it said, “No Cheesecake". You seem like a pretty stylish dude... Neptunes stylish, even. Are you actually Pharrell Williams? Nah. I just feel like I have LA swag. Just like my whole demeanor and just the way I carry myself. I'll have some Chucks on, and I'll go with some fitted jeans – WAIT, are you talking about, like, clothing? Yes. Hahaha. Alright. Okay. Fitted jeans. Chucks. V-neck. Throw a snapback on or a trucker cap. You've been soliciting resto advice via Twitter. You know that means people know where you are, right? Yeah. Uh. Haha. You done much exploring yet? Me and D-Will probably went [to the Mall of America] every day. The Mall of America? Seriously? There was really nothing to do so we just went there. We go to Seven a lot... the Trinity Wings. And also, what's it, Lucia Pizza? Pizza Luce. Yeah, it was good stuff. What's up with Derrick Williams (@RealDWill7) and all the "LOL"s on Twitter? Aw! That boy! That's Derrick Williams. I mean, he's goofy. If you actually get to know Derrick, Derrick? He's just a goofy guy. So like, that's probably why he's throwing the gang of LOLs out there. Team Edward or Team Jacob? Twilight?! I'm thinking Team Jacob, only reason being that he's a werewolf. [Looks at Wolves logo on court.] OH! I didn't even realize. I said team werewolf cuz that's how I approach life: You've gotta have a wolf mentality. You wish Christian Laettner was still on this team don't you? Christian who? Who dat? In all honesty, some great players have played for this organization, and so has Brian Cardinal. Talk about that. Brian Cardinal? Big, unathletic white guy? The Wolves have had a few. Like Mark Madsen. Oh, I know Mark Madsen. Haha. What's it like receiving passes from the smoothest Spaniard to hit America since Antonio Banderas? You just always gotta keep your hands up, always looking, because even though he not looking at you, he sees you. Ricky Rubio repeatedly tries to hail cabs outside of the Target Center wearing no jacket. Aren't you afraid he'll catch a cold? He's probably not used to it. Spain doesn't sound like a cold place, so I mean, he just gotta put a coat on. He's been spotted shopping at Target with his mom and sister. Yeah. Actually, when I came up today I saw his mom dropping him off like he was in middle school. I was getting out of the cab and I saw Rick's Tahoe and I was thinking he was about to get out, but his mom was driving. How does it feel to be traded for a guy named Nikola Mirotic? Traded? I was traded for him? Aw, man, I wasn't even paying attention. I don't even really know to tell you the truth. In your Twitter bio (@Leezy3) you say “grab some popcorn.” What if I don't like popcorn? Hey, grab whatever you like because it's going to be showtime. Entirely True Editor's Note: At 925p that night, @RealDWill7 tweeted "Cheesecake factory with @leezy3". You're welcome!